Maybe deep down inside, you knew Angelina Jolie's marriage to Billy Bob Thornton wouldn't last. Somehow you still wound up admiring the guy and want to give Billy Bob a high five for that feat. 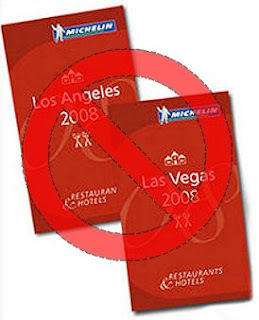 In many ways, a pause was on the back of my mind when it was announced two years ago that the French Tire company Michelin who started this red book to help travelers around Europe to find good places to stay and worthwhile places to eat, would be adding a new addition to our fine city of Los Angeles. I was skeptical on how long they would keep this edition. So it came no surprise to me on Friday when it was announced that the Michelin Guide will "temporarily" suspend the Los Angeles edition along with the city of Las Vegas for their next 2010 issue. Only one reaction have came to me. Finally. -- and good riddance! Late last year I wrote a post about the exclusions of many ethnic restaurants in Los Angeles edition of their fable guide. Even though the Michelin Guide stated that ambiance and service was not part of the grading system or the determining factor, it's pretty obvious that the European inspectors tend to favor the upscale fine dining establishments. Of course, the rival pundits who annually put up a list for LA diners (such as LA Weekly, LA Times, and LA Magazine) have all pointed out the inspector for the LA list does not like ingredient based dishes, but tends to favor the standard fare with beautiful presentations. Also the big complaint of obvious objections to the guide not venturing out to other parts of LA for a fairer assessment of the best places to dine. It was always comical to me that they present their guide with two simple lines of minimal description with the awarding of the stars grade as the only indication of how the restaurant will be. Even a list of some restaurants that was included in the "Bib Gourmand" section drew an irate reaction such as the inclusion of places that would be consider to be question choices (such as Empress Pavilion as one of the only 4 Chinese restaurant selections in 2008). For me, I used it as check off list for places I have visited. I knew two of my fellow dining buds, Notorious P.I.G. and kevinEats have also included the stars as part of the indications of places they have visited based on the list. With that list being vanquished for at least one year, we won't be hearing about how Gordon Ramsay got his restaurant undeserving in this list (Gordon Ramsay at London) or how restaurants with $50 per head are always on that list. By the way, why is Bastide even part of that list? They are not even opened before the 2009 was announced! You'll probably see more of Essential 99 ramming down our throats for years to come. Jonathan Gold will be shilling Nancy Silverton and Suzanne Goin's restaurants to remind us on how great these two chef's places (AOC/Luques and both Mozza) are. Oh joy! Speaking of which, since the list is gone, which new restaurants would have been on the list? Are there any restaurants worthy of three stars in their grade? Nope on the three stars, but I do think places such as Bazaar and Angelini would probably granted one star in the list. I would have enjoy watching Bastide, Patina, and Water Grill off the list. Any places you want to put in or leave off the list? Fiona's now known as "Notorious P.I.G."? Regarding Bastide, they closed in late November, after the 2009 guide came out (in October I believe). New entries this year for 2010 would have been Bazaar, Drago Centro, and Muse. Maybe Rivera and XIV too. Why all the hate for Water Grill? I've always loved that place! The word verification for this comment is "axedish." Neat. I want the name of Gourmet Pig from her. She'll be refer by me as the Notorious P.I.G. for now on. Dragon Centro and XIV? Wow, those two got mixed from others. So you do enjoyed it that much. I think XIV will have to be on my agenda in the fall or late summer. Too many other places that are on the list now. Wow, I guess I will need a refresher visit to Water Grill. I think most recent experience with the chef was at 5x5 dinner at Providence. The dish was not the highlight as it was not up to par with the other dishes. However, I'll give this place another go since I haven't really visited this place in a long time. Wow. Ok, you confirmed what I was thinking about XIV and Drago Centro, but I still want to visit XIV down the road. BTW, c'mon...you have always been notorious! Seriously, ask anyone. :P J/K! You think Michelin pulled out of LA because of the bad rep they got for their lackluster review process and controversy they received for it? In their press release, they cite bad economic conditions, whatever that's supposed to mean. Their first edition was very poorly written and accusations of biased was raised. The Michelin Guides for LA never really set any standards for must visit restaurants.